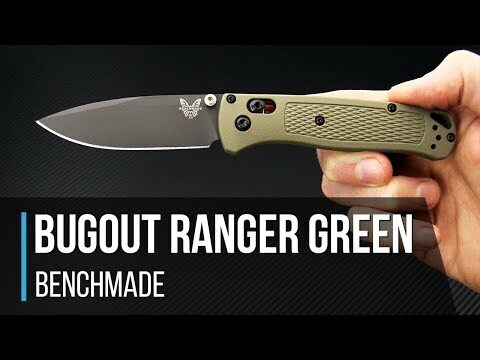 The Green 535GRY Bugout folder from Benchmade Knives was built to be one of the toughest, lightest folders in its class to go anywhere you do. It's extremely slim, ergonomic and comes with premium materials at an outstanding price point. Putman Scales: The knife comes with custom Grooved Black Canvas Micarta Putman Scales installed. Blade: A classic drop point with top swedge delivers a highly utilitarian profile for use at work or in the field. Made from premium CPM S30V stainless steel the blade offers a fine balance of edge retention, corrosion resistance and toughness for every day use. A Smoke Gray Chromium Nitride coating offers enhanced corrosion resistance and a discreet, non-reflective finish. Effortless opening and closing from the left or right hand side is facilitated by the two tan anodized aluminum thumb studs and a phosphor bronze washer pivot. Handle: Replacing the standard factory scales we've installed* Anso-style Grooved Black Canvas Micarta Putman Blade Scales for an upgraded look and feel. Tan anodized aluminum barrel spacers create easy-clean construction and an oversize hole at the pommel allows for easy lanyard attachment. A DLC (Diamond-Like Carbon) coated titanium AXIS lock bar enhances durability and corrosion resistance. Even with the custom scales this cutting powerhouse still tips the scales at under 2 oz. Factory deep carry clip is installed for right hand, tip-up only carry. 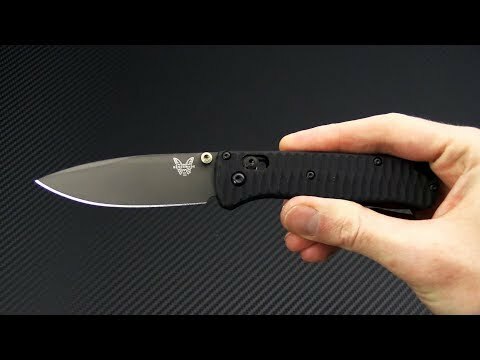 * Note :Disassembly of the knife voids the Benchmade warranty.